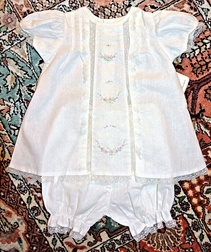 A beautiful white top and bloomers set for baby infant girls by Remember Nguyen. 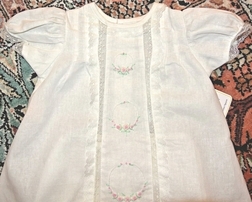 The sleeves, hem and bloomers are trimmed in lace and it has 2 lace inserts down the center. 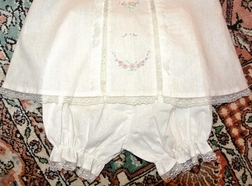 It is made with little pintucks and ruffles on the sides of the center lace inserts. The most lovely aspect of this outfit is the 3 hand embroidered pink and green laurels/wreaths down the center fabric panel. Perfect for bringing baby home from the hospital, baby gifts and showers, and of course church.